Sometimes you have to let go of the past and learn to trust again…but that’s easier said than done! Julia Merina always thought her life would be simple – go to college, meet Mr. Right, find her dream job, and live happily ever after. But just shy of 25, she learns the hard way that life rarely goes according to plan. Now, at age 28, Julia’s life revolves around her three year old son, Carson, her career at Oceanic Marketing, and her supportive family. After the turbulent years of her early 20s, Julia resolved to never trust a man again. That is until Drew Parkington, an old classmate, suddenly comes back into her life. Julia is forced to examine her life and decide if she can let go of the past and learn to trust again. A great piece of advice I received when I first started writing was to write about what you know so that’s what I did. 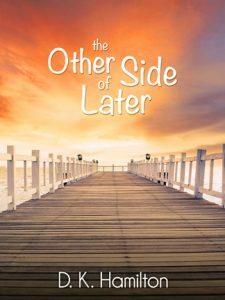 My latest (and only so far) book, The Other Side of Later, takes place in a small town on the Jersey Shore. I’ve been a resident of South Jersey for my entire life so the places and even a lot of the characters reflect what I know best. Someday, I hope to step out of that comfort zone, but for now, I like that my stories reflect where I come from. I think it gives them a sense of authenticity. Julia, the main character, had a pretty rough go of it through her early 20s, and now, she’s facing life as a single mom and unsure whether she can let go of the past (and her mistakes) to move on and trust someone again. I identified with Julia a lot as I wrote The Other Side of Later. Did my early 20s resemble hers? No, not even close. However, Julia has a hard time forgiving herself for some of the choices she made. And that’s something I relate to and I think a lot of other women can too.